This is Apollo's third catalog, released as an update to their second catalog to replace Lochjaw with Shark Attack. The name was changed due to a lawsuit over the name’s similarity to the movie "Jaws". Outside of this change, the catalog is very similar to Apollo's previous offering. Additional changes include the removal of a star border around the Limited 90-Day Warranty box and a change of the copyright year from 1981 to 1982 on the back cover. 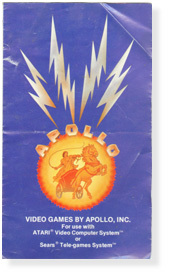 The color of the background behind the description for each game is the same color as the label the cartridge was produced with (these are Apollo's original labels).